Jay Miner began development of the Amiga way back in 1982, and initially the machine was designed to be a next generation video game console. The design changed from console to computer following the North American video game crash of 1983. The first prototype Amiga was demonstrated at the Summer Consumer Electronics Show in 1984, and was released in 1985 by Commodore following their purchase of the Amiga Corporation. 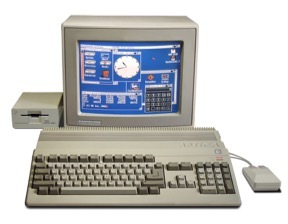 The first Amiga model was the Amiga 1000, which was released on the 23rd July 1985. It came with a base configuration of 256KB of RAM and cost $1,295 USD. The Amiga 2000 was released in 1987, alongside a lower cost Amiga, the Amiga 500. In 1992 the Amiga 1200 and 4000 models were introduced, offering improved specifications and expandability. Commodore filed for bankruptcy in 1994. I got my first Amiga, an A500, just before Christmas 1990. As my previous computing platform was the humble ZX Spectrum, the Amiga was a massive jump in terms of graphics, sound, processing power and general features. Not long after the release of the A1200, I part-exchanged my A500 for Commodore's latest machine, and over the course of the next twenty or so years, have continually expanded it. I currently own both an Amiga 500 and an A1200. The Amiga 500 has been expanded to 1MB of RAM, and the internal floppy drive has been replaced with a Gotek USB drive. Mr. Numpty and The Alien Invaders - A Jet Set Willy clone released in 1992. How I stumbled upon this PD platform game, plus a few words from the author.